It’s that time of year again. Resolution time. Some approach this with an excitement to clear the slate, start anew, and to create and commit to new personal goals. Others may find themselves turned off, discouraged, or scoffing at the idea of “New Year’s Resolutions”, looking to the many resolutions that have gone undone, left unfinished, and not followed through, by themselves or by others. Regardless of our enthusiasm or reservations about resolutions, the mark of a fresh year gives us the opportunity to reflect on the past year, and look ahead to what’s to come in the next 12 months. Specific – Define your goals as clearly as possible. Consider the who, what, when, where, and why. Who is involved, what do you want to accomplish, when and where will it be done, why are you doing it, and which resources or limitations are involved? Measurable – Identify how you can track your progress and know when your goal is accomplished. Attainable – Goals should be both challenging, yet achievable. Make sure your goals are realistic and possible. Take caution not to set goals that are out of your control. For example, resolving to “Get the promotion at work”, which depends on who else applies for the promotion and the decision of the boss. Instead, “Get additional training and experience that will qualify me for the promotion”, is completely in your hands. Relevant – Set goals that are important to you, and applicable to your life. Is this resolution something you care about? This ensures the purpose and motivation behind your goals, and increases the likelihood that you’ll stick with it. Timely – Identify a realistic time frame for achieving your goal. Break it down into smaller steps, working toward the larger goal. Creating a time-bound goal, ensues a sense of urgency, motivating, and keeping you accountable to your goals. Make sure the timeframe is as realistic and achievable as your goal is. 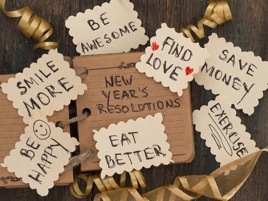 Share your resolutions with close family and friends. It’s easier to stick to it when you have others partnering with you, holding you accountable to your goals. This could mean setting individual goals, sharing them with one another and mutually checking in on each other’s progress. Or you could team up on similar goals, creating a game plan together, and helping one another achieve your goals simultaneously. Whatever your resolutions or goals for the new year, give yourself grace in the process. We will all stumble and fall at times. Creating new habits, stretching our skills, and growing in any way takes time, intentionality, and patience with ourselves. If you’d like to discuss your goals further, our counselors are available and always here to listen, assist, and empower you to live your life well.